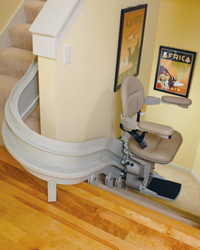 When a stair lift becomes part of your home, it’s imperative to think about others who will go up and down the stairs. Most individuals require some space to travel from one floor to another without having to step over anything or worry about trips and falls. In addressing this scenario, you need to consider your stair lift: Particularly, whether it will go around the wall at both sides, essentially curving away so it won’t block the path, or fold up at either end. 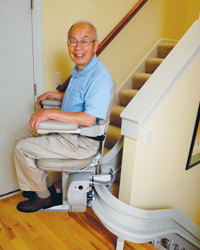 When a stair lift gets installed, it’s often as a last-resort effort. That is, homeowners with impaired mobility haven’t been able to access the second floor for some time and, in the process, have modified their lives to fit on the first floor and front steps. 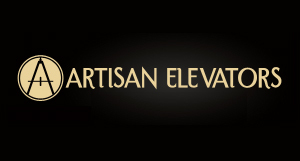 It’s recommended, then, that once a stair lift is ready, any homeowners must become accustomed to using the second floor as part of their daily routine. This could be allotting time to clean the area, or moving back some features that have migrated down to ground level. You never know when repairs or maintenance will be needed. To be ready for anything costly, always make sure your system comes with a warranty. As you go about your search for a mobility device, explore your residential options with Indy Stair Lifts. Browse our site for a range of sizes and configurations for your home.